Peng's Homestyle Bean Curd - mmm-yoso!!! 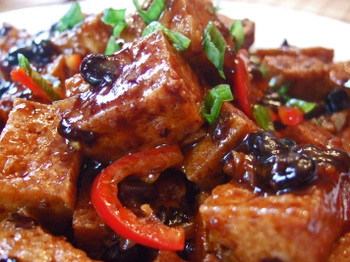 You may be asking, "who the heck is Peng, and why is this bean curd dish named after him?" Well, Peng Chang-Kuei(彭長貴) is a famous Hunan Chef who fled to Taiwan when the Nationalists were on the verge of defeat to the Communists in 1949. He is credited with creating what could possibly be the most well known "Hunan" dish in the Western world, which in fact was not a product of China; General Tso's Chicken. Fuchsia Dunlop tells the story here. Or even better for more stories, as well as the commentary on this recipe get a copy of her book on Hunan cooking; Revolutionary Chinese Cookbook: Recipes from Hunan Province. I found most of the recipes in this book to be easier than those in Land of Plenty. Just like Barbara Fisher, who made a version of this dish, and documented it on her wonderful blog Tigers & Strawberries, we love the simplicity of this dish. I took a few liberties with the published recipe. For some reason the Missus wanted a vegetarian dish, so I excluded the sliced pork and stock. Because of this, I increased the amount of garlic and dark soy sauce. Also, after cooking a few dishes from the cookbook, and reading Fuchsia Dunlop's commentary, I added a touch of sugar to the recipe. 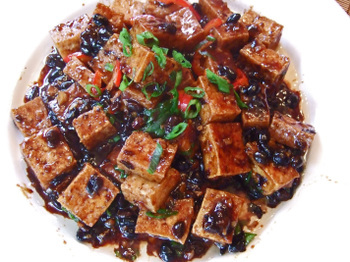 According to the book, Hunan tastebuds are not fond of combining sweet and savory in their dishes. Adding just a bit of sugar seemed to open up the flavors a bit. I use only enough Sesame Oil to add a faint fragrance, and not over-power the dish. One more thing, if you've ever eaten in a good Sichuan or Hunan restaurant, you'll notice that black beans(do not soak) are never crushed, but cooked whole. This explains what seems like the huge amount of black beans in the dish. 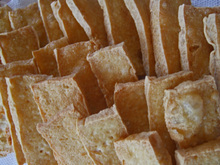 1.Cut the block of bean curd in half diagonally, than lengthwise. Place bean curd on a folded paper towel, place another paper towel on top of the bean curd. Place a plate on top of bean curd with and top off with a few cans. I do this to remove excess water out of the bean curd. 2.Rinse the Black Beans(do not soak) and set aside. 3.Thinly slice the scallions and seed then thinly slice the Serrano Chilies. Tear the Dried Chilies and remove seeds. 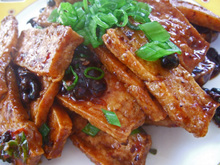 6.Drain bean curd and set aside. 7.Drain oil from wok, reserving 3-4Tb. Clean wok, dry, and reheat over high heat until smoking. 8.Add the dry chilies and scald. Add garlic, black beans, and Serrano Chilies and cook until fragrant. 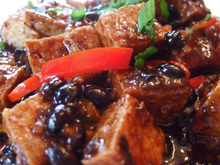 9.Add water, bean curd, and dark soy sauce, and bring to a boil. 10.Reduce heat to a simmer, taste, and adjust flavor - add salt and sugar if desired. 11.Add potato starch mixture a little at a time, until the desired thickness is reached. 12.Remove from heat and stir in Sesame Oil and Chili Oil. Top with scallions, and have at it. I don't know...it's either diminishing returns on my pallete, or garlic is just getting dumbed down evolutionarily. Looks so good! Whoever says tofu is tasteless should try out dishes like this. BTW, did you use (or will try using before the fire season starts) the Big Kahuna to make this? Those pictures give me a terrible desperate urge for spicy tofu! And I'm listening to whose voice on your podcast? Is it an electronically generated one, or do you use special effects? Very cool! Hi Jan - LOL! Just don't rub those chilies into your eyes...you'd wish you never woke up. Hi Liver - This is good stuff...easy to make too. Good bean curd is essential. No kahuna for this one; but we've been using it about 4 times a week since we returned from vacation. It turns stir fried greens with just salt-garlic-dried shrimp into something really good! Those fermented black beans have an effect on my G.I. tract not unlike the one you described from the residue laden drinking glass in Bac Ha. Maybe this is why I prefer ma po tofu, which as the story goes was invented by a pock faced (ma)old wife (po)who put this together from common ingredients in her kitchen. It was so good, the rest is history! Hey Kirk, ever consider a shot at real "Chongqing" mapo doufu? You know the stuff with chili oil on top and peppercorn everywhere. Hi Chris - There are several stories about the"Pockmarked-face Lady's Tofu", one harkens back to the Qing Dynasty, and one to World War II - makes for an entertaining story. I'm hoping you've tried the Ma Po Dofu from Ba Ren - when I take people who have never had(real/good) Sichuan food before to Ba Ren, this is one of the dishes I order. 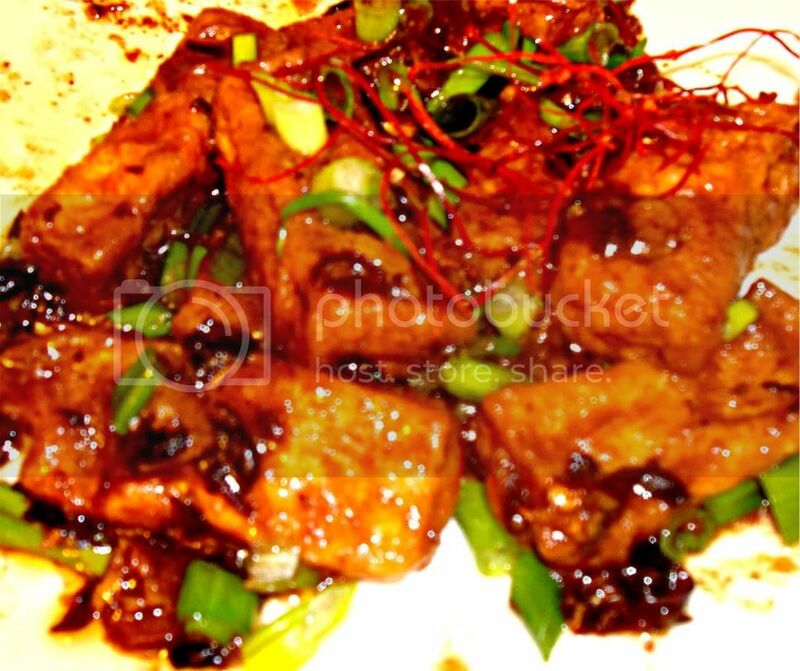 I'm not sure if you know this or not, but I've read that the usualy "meat" used for this dish in Chengdu is not pork, but beef. Hi KevinK - You know, I may just make some ma po dofu....thanks for the suggestion. Hey Carol - You better find him right away - he's like almost 90 now! I tried making this dish too. Except I put in too much peppers and I didn't rinse the black beans. Overall, a little too beany but I think you are right. It does need the sugar to balance it out. Another thing I would consider doing is salting the tofu to try to extract some more of the moisture then doing a quick rinse. This may give it more flavor and leach out more of the tofu beaniness. Another way to introduce a little sweetness to the dish would be to use sweet bean paste. Not the red sweet paste but the stuff that you use for jia jiang mien. Hi Jeffrey - Thanks for the salting the dofu hint....I often do that with vegetables. Dofu, I like to press to drain, but I may salt it just to see. When the dish is done right, it has a nice balance of flavors. Hi Chris - I'm glad it worked out..... man just the scent of black beans thrown into a wok is enough to send my tastebuds into a frenzy.